Just up the coast from where we stayed in Tenerife is a small fishing village called La Caleta, there’s hardly anything there: a few houses clinging to a small bay, villas here and there and a handful of bars and restaurants. And ocean views to die for. 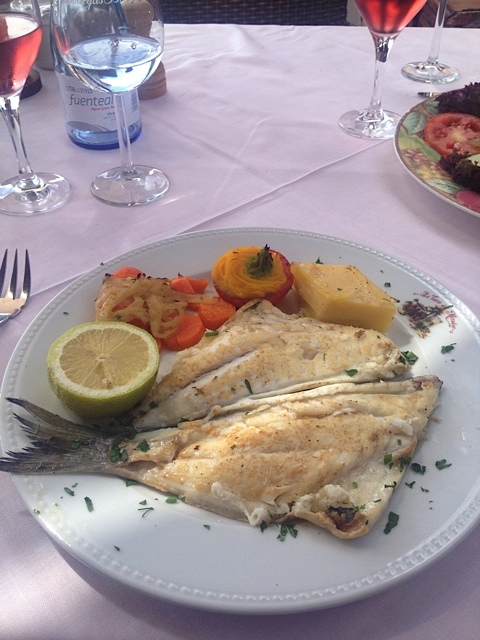 Masia del Mar is an inauspicious doorway in a side street that opens out into an old fashioned, relaxed family restaurant, fish bubbling away in tanks to the front, an open plan kitchen to the side, all industry and warmth. The best seats, if the weather allows, are on the terrace which overlooks the Atlantic Ocean and on this occasion, we were ushered to a nice table with good views. The restaurant was busy which is a always a good sign on a Sunday night in December. We ordered some house cava to get the ball rolling and then a bottle of Canarian Viduenos white, which was exceptionally good for the modest price. 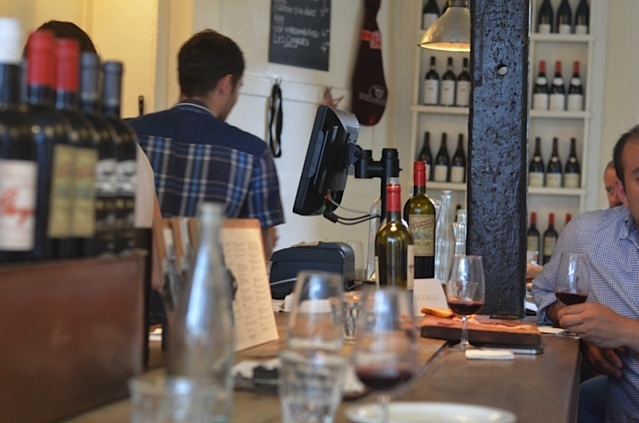 We’ve found Canarians will always try to sell you a local wine (and we would always request local produce) and although they are oddly more expensive than mainland wines, it’s worth giving them a try. It’s pretty easy ordering food here, the seafood is spankingly fresh so you can’t go wrong, unless you don’t like fish of course, in which case you are in the wrong place! 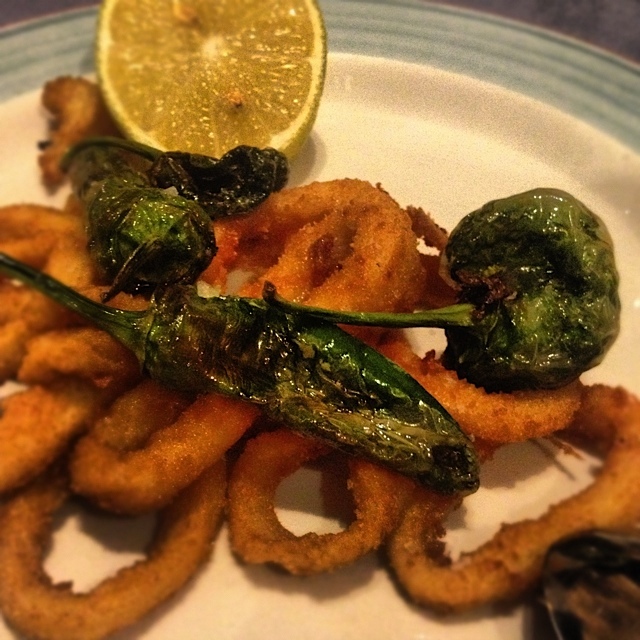 To begin with, we ordered the obligatory padron peppers and a plate of baby squid, fried in a light as air batter, well seasoned and piled high. It’s worth noting that starters are good value and over ordering is a danger as portions can be large. 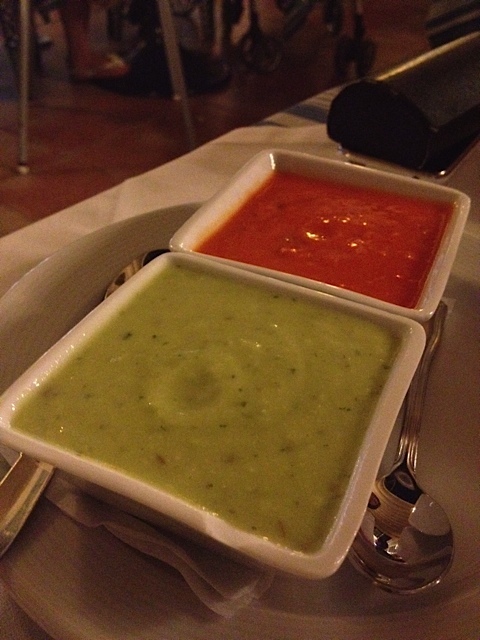 These were served with the local Mojo dipping sauces, one fiery, one cool and soothing. 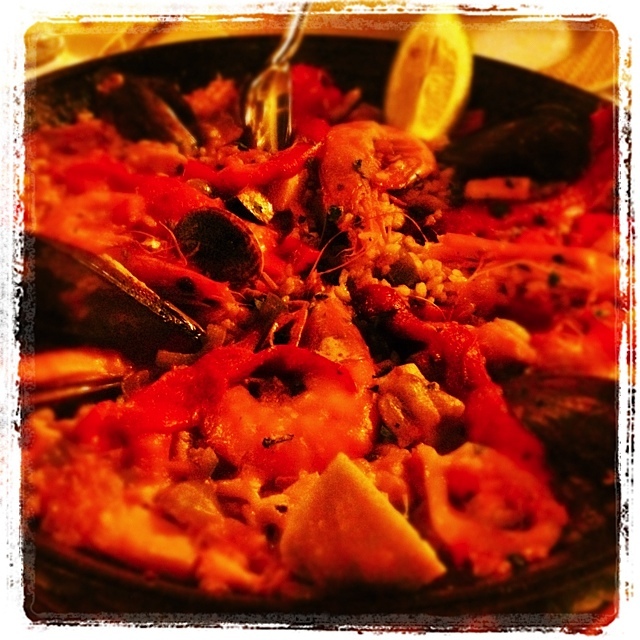 For mains, we decided to share the house speciality, seafood paella. 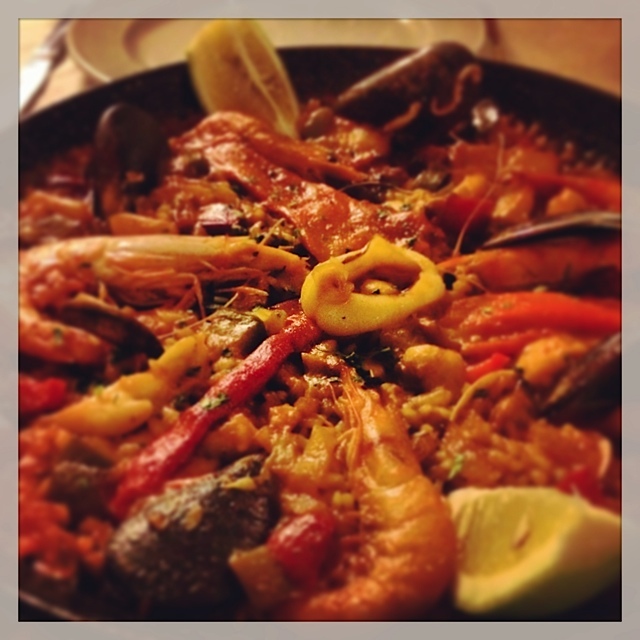 All Spanish restaurants would lay claim to their paella being the best in the area, but we’ve eaten here before and we know that their paella is certainly the best we’ve ever tasted. 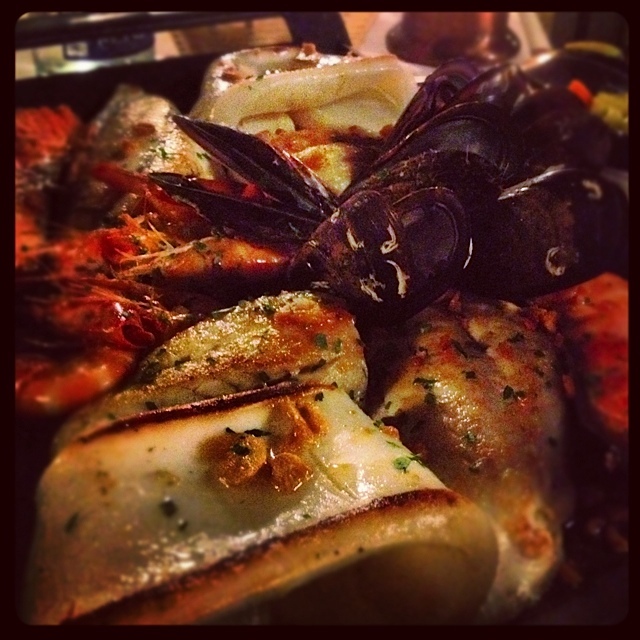 Packed with seafood, the secret is the stock: deeply fishy, speaking of the ocean, the product of a long, slow process. The rice is sticky, moist and a vivid amber colour, not just a sideshow for the seafood, but demanding attention. Service is businesslike and friendly, not much English spoken but very easy to get by with a bit of Spanglish on the go. Masia del Mar is a place of simple pleasures, food to calm the soul and nourish the spirit, elegant and timeless, you get the feeling they’ve been doing the same thing well for years and will continue to do so in years to come. A return trip, pre Christmas, to the warmth of the Canary Islands, saw us visit the capital city of Tenerife, Santa Cruz de Tenerife. Projecting all the grandeur of a big Spanish City, Santa Cruz definitely had a South American twist to it, betraying some of its history perhaps as there are strong geographical, historical and, in turn, culinary links with South America. Either way, we got the bus from the touristy south of the island, about an hour by bus up the dramatic Atlantic Coast highway. 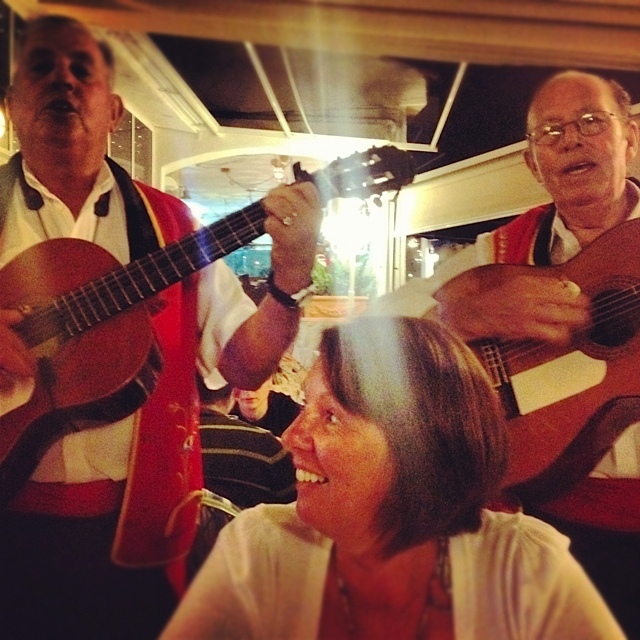 We had no set agenda as the bus bowled Northwards at a hair raising pace, but had read about an interesting tapas place run by renowned Canarian chef Braulio Simancas, so we hunted it out when we arrived. Tasca el Callejon is tucked away in a quiet side street away from the hustle and bustle of the main thoroughfare but thanks to google maps we found it right away—gotta love technology. Too chilly today to sit outside (there was a storm brewing), we settled at the bar which is always the best place to sit in a tapas bar I think and the very friendly, mostly Spanish speaking waitress presented menus with English translations, although I like think we would have got away with the Spanish menu. We took in the old world style of the restaurant: rich dark wood, impressive original brass coffee machine/urn, newspapers on sticks, if there was a grandfather clock, it would be ticking away in the corner. In short, a lovely place to while away an hour or two over a long lunch. 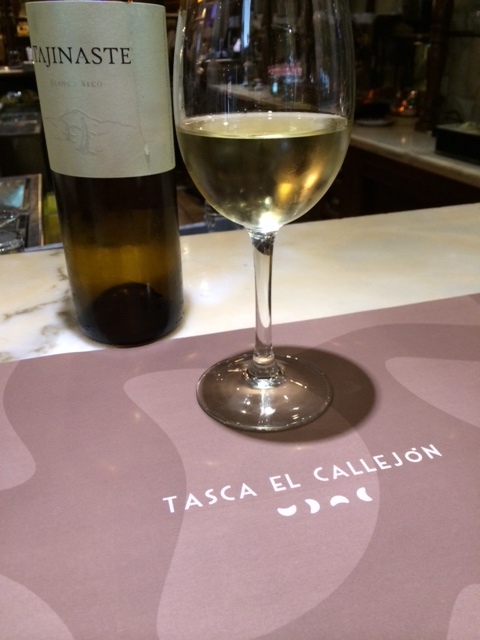 We ordered a bottle of the Canarian vino blanco to get things underway—crisp and fresh—a bargain at 12 Euro, and got down to the menu. We ordered just three dishes: hand carved iberico ham with crisp tomato and garlic bread, irresistible croquettes spiked with chilli and finally, pork loin, tender and unctuous with figs. The portions were good sized and we were sensibly advised by the waitress that three would suffice and she was right. The Iberico fat stuck to the roof of your mouth as it should and melted delightfully, the croquettes popped with aromatic steam when cut with a fork and the pork loin was a revelation, sticky and sweet, served with hand cut rosemary potato fries. I rued not trying other dishes on the menu that caught my eye, but that would have been pure greed: slow cooked veal cheeks, local smoked salmon with coriander…It’s times like this that only a tasting menu will do, but what we did have was both delicious and filling. Finishing off with a coffee and an outrageously large ‘ Spanish Cardinal Mendoza brandy— Christmas in a glass, delivering warmth and spice—we were happy as Larry perched at the bar jealously observing a large Christmas party as they arrived, surely to be treated to a long, late and lovely festive lunch. 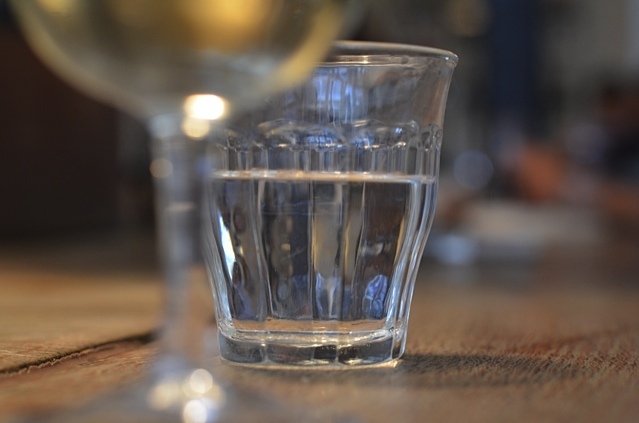 We reluctantly paid the bill and left, anonymous diners hurrying back to a concrete bus station, clocking the steely grey storm clouds gathering, as the bus left the station, speeding southwards. 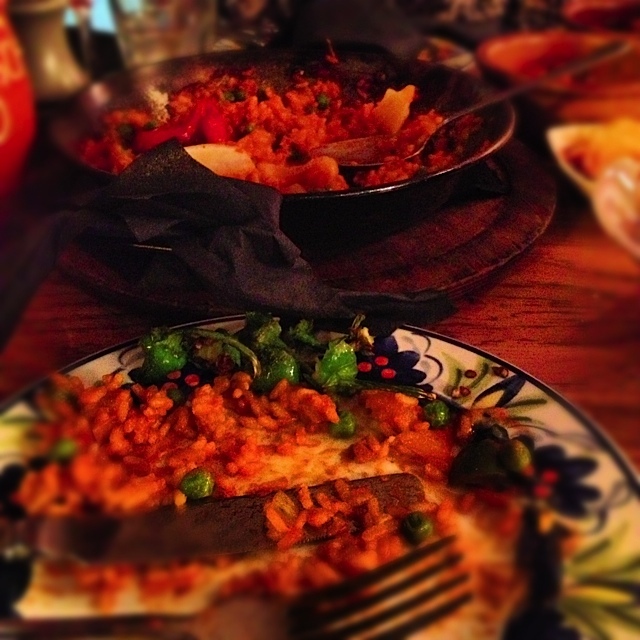 Hot on the heels of our delicious week in Tenerife we were invited to try the new winter menu at La Tasca in Leeds. Unfortunately we were unable to attend the paella masterclass with the Group’s head chef (they are part of a rather large chain) up from London. We were subsequently invited to come and try the menu on a normal evening. 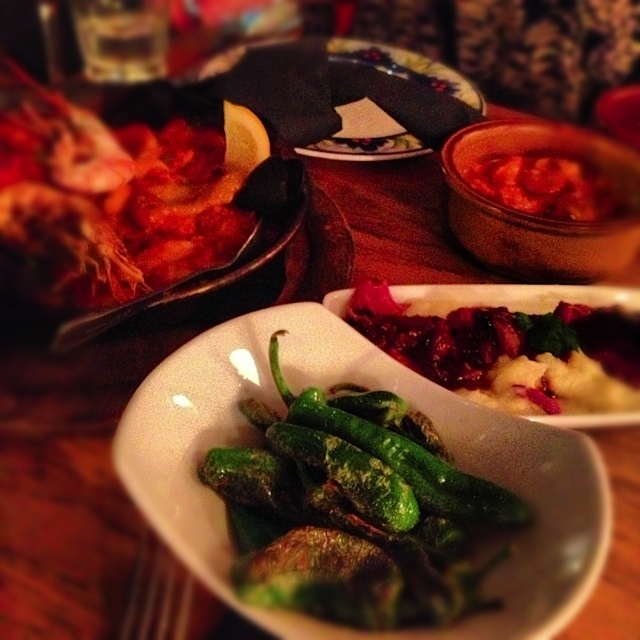 We’d never been to La Tasca before so we took up the offer with no preconceptions. 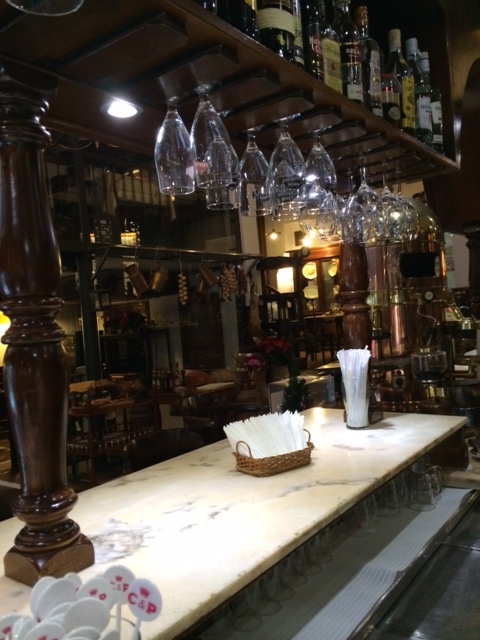 First impressions of La Tasca are good – light, bright, modern interiors very much like the sort of contemporary place you might find in Valencia or Madrid. Midweek was fairly quiet and it’s location is certainly a very competitive one – Greek Street is wall to wall restaurants, most of them chain operations. 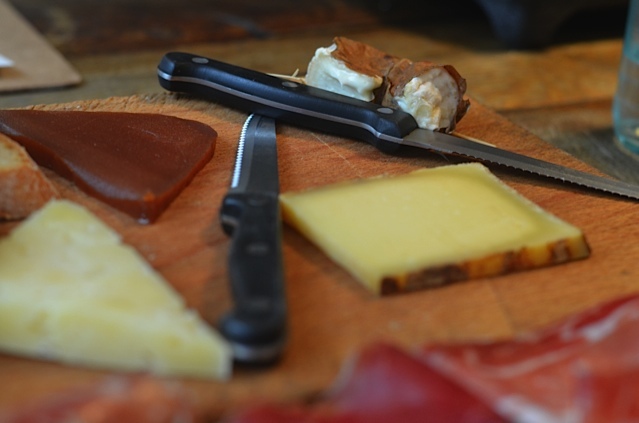 To start we shared a plate of cured meats with manchego, bread and olives. All very good I have to say with bread nice and fresh. 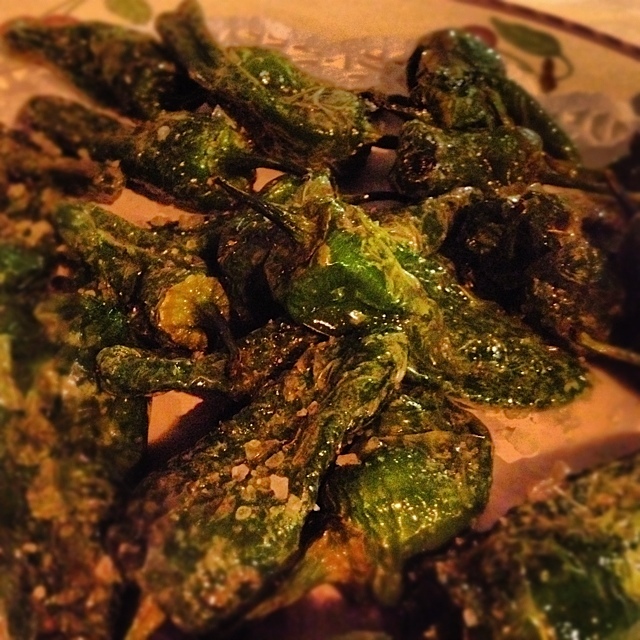 We then ordered from the new menu a range of tapas dishes – pigs cheek, padron peppers (our favourite of course), pork and chicken meatballs and a chicken & chorizo affair. Feeling greedy we also ordered a seafood paella which we were assured wouldn’t be too much food – I always over order with tapas. Service was quick and attentive but then they did know I was a blogger which I always think makes a difference. All the food came at the same time which worked OK, but we did say that we’d be happy to have Tapas then paella, but no drama. I do like how in Spain all the dishes come out randomly spaced out time wise depending on how bothered the chef is! We’re a bit too wedded to our three courses in this country for my taste, but hey. 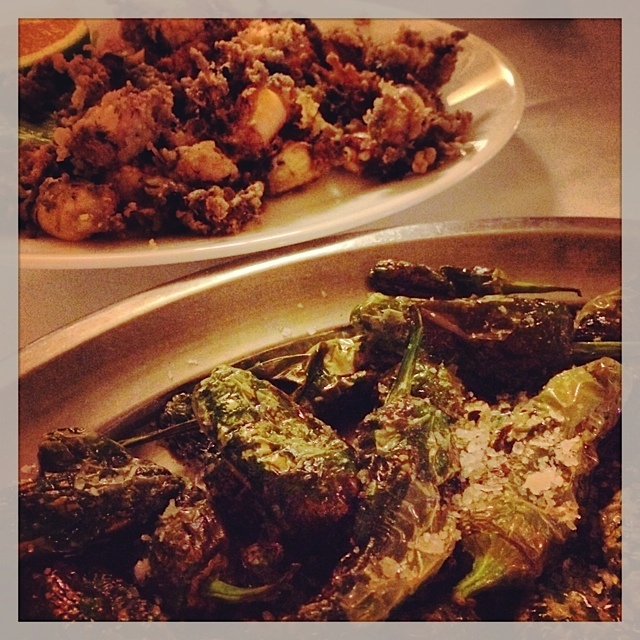 Successes were: pig cheek (tender and sweet) padron peppers (although under seasoned) and the seafood paella. The other dishes were a little bland for me and I wasn’t expecting the paella to be close the standard of the one recently in Masia del Mar in Tenerife, but it was pretty good actually – although the shellfish on top were dried out by the heat. 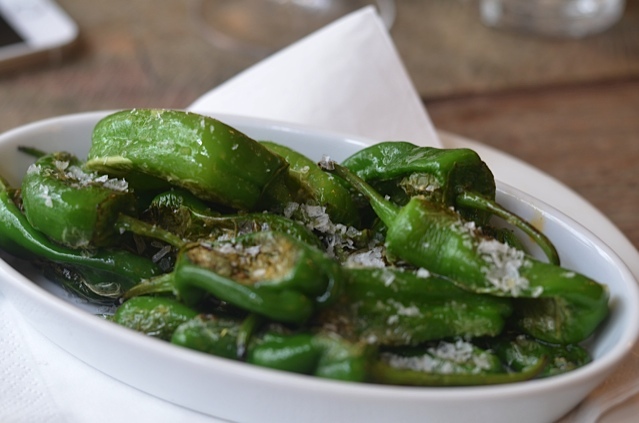 We came away thinking we would definitely return to La Tasca, particularly on a weekend lunchtime where we thought it perfect for a lazy lunch and few glasses of wine. It brings me back to the old debate about chains versus independents again but my view has always been that if a chain restaurant is doing a good job and filling a gap in the market then it will succeed. And I do think that La Tasca is doing that very well indeed. Although city centre mid-range restaurant competition is fierce, there is very little ‘Spanish’ competition in the city (other than South American Tapas places like Viva Cuba), it will continue to flourish under its new brand and revived menu. 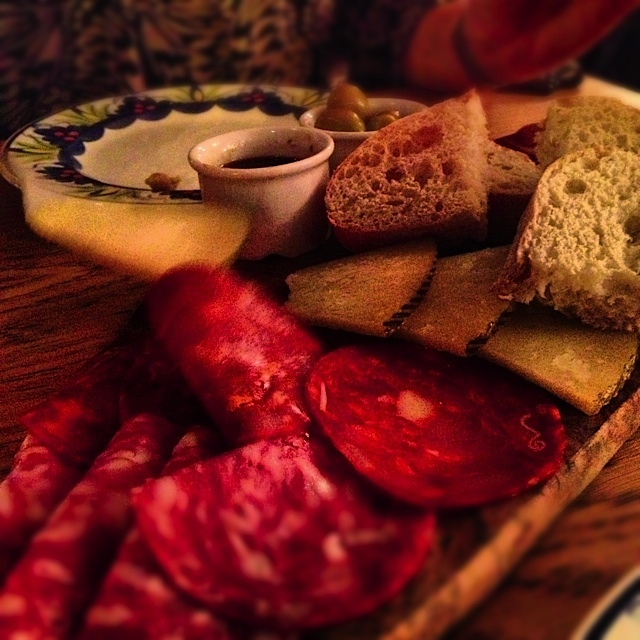 La Tasca is a bright, breezy and unpretentious city centre restaurant perfect for everything from a tricky first date or office leaving do. It has the backing of a chain to get the ingredients and service right and although the food isn’t the best in Leeds, it’s of a high standard and certainly caters for a certain crowd that will keep coming back for more on this evidence. 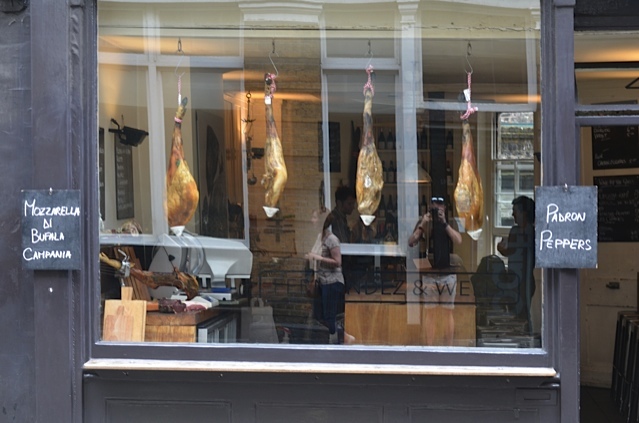 Rather than a full blown review of every place that we ate at on our recent visit to Andalucia, I thought it would be more interesting to talk about more generally about the food that we encountered. Our holiday was all about escape and relaxation and the location in the mountains near Comares was absolutely perfect and although the roads were pretty hairy, it was well worth being off the beaten track, away from the tourists. 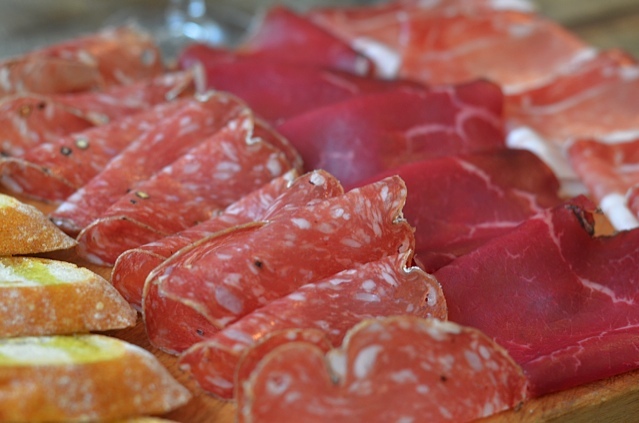 First things first – this is meat country. The Spanish have mastered how to eat an entire pig without it getting boring and very menu proudly displays the evidence. Suffice to say my vegetarian sister struggled somewhat when eating out. Combined with the fact that we were eating essentilly in the countryside, it meant the food was simple, traditional and rustic. In the mountains the food is probably just as it was fifty years ago, if not more, and that’s just how the local like it. Down nearer the coast – where all the tourists are – then it’s way more accessible with English food (and language on the menus) and lot more seafood. 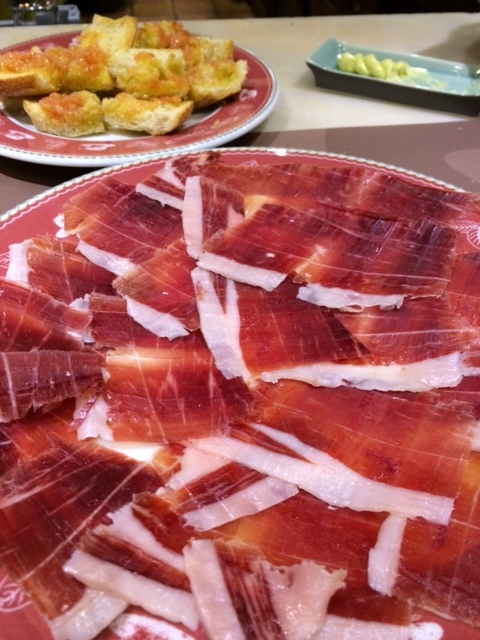 Personally I quite liked the rustic nature of the food on offer in the local places and we ate very well in the villa with fantastic Jamon packed with flavour, amazingly vibrant fresh salad and super local cheeses. Given we had to drive 15 minutes to the nearest supermarket and restaurant, we minimised our time on the hairpin bends and rationed our drive times. The local food and drink was cheap and very plentiful. The non-tourist nature of the area was borne out with great local vino on sale for around 2 Euro (and it wasn’t vinegar either although it did benefit from a chill). 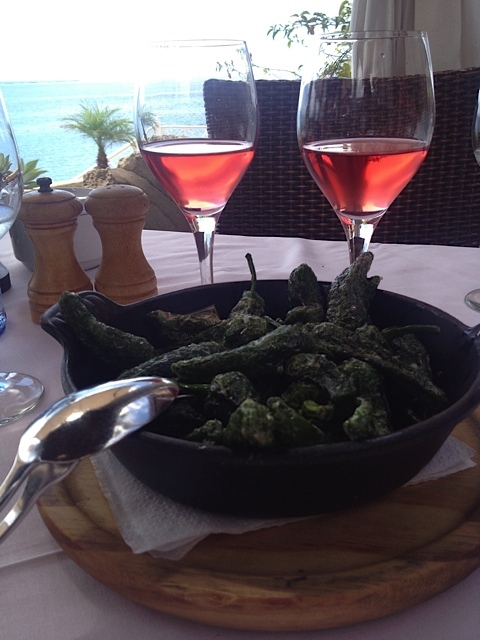 Special mention has to go to the Padron Pepper – the vegetable I ate every single day. Man, I need to get some of these in the UK, even if every fifth one turns out to be a full blown chilli and kicks you right in the tastebuds. On the last day of the holiday, heading back to the airport we happened upon a very cool and down to earth resort just outside Malaga that was full of Spanish day trippers eating fantastic looking seafood. The ubiquitous sardines were cooked right there on the beach over embers and it would have been both rude and ridiculous not to try some (they were sublime and very, very good value at 3 Euro for a bundle). 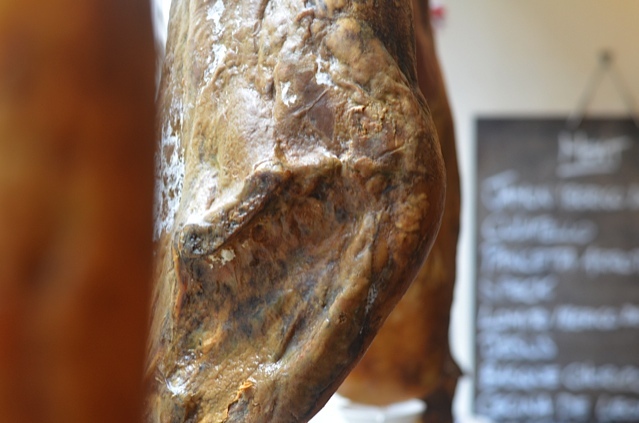 From a food perspective, I think this part of Spain struggles to compete with the choice and sophistication of some of the more cosmopolitan cities or the Michelin littered Northern areas. 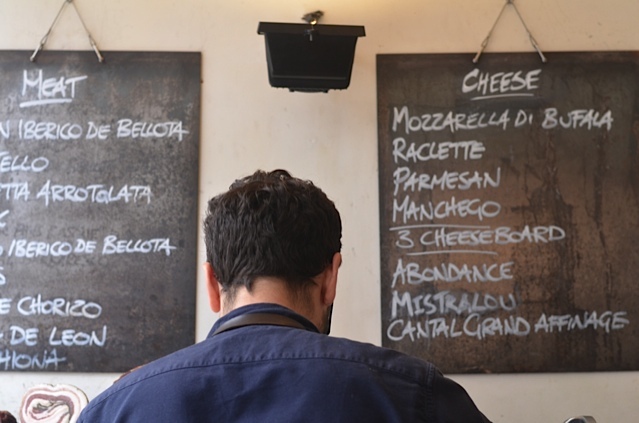 What it is though, is unpretentious and down to earth food, that’s easy to get on with and all about the ingredients. I don’t think we fully explored it by any means, and I’m only offering a snapshot of a couple of weeks’ eating, but I definitely would recommend it unless you’re a vegetarian.